As you can see, I'm still happily rocking my summer solstice nails, and they've been really easy to wear :)) So far, I've paired them with other tertiary colors in my wardrobe (indigo, chartreuse, turquoise etc.) and they've worked very well. Here I'm wearing a cyan colored tank and I think both colors are making my tan stand out. P. S. I finally reshaped my eyebrows (I've been letting them get out of wack for too long) and filled them in using a brown pencil instead of my usual charcoal to match my sun-lighted hair. 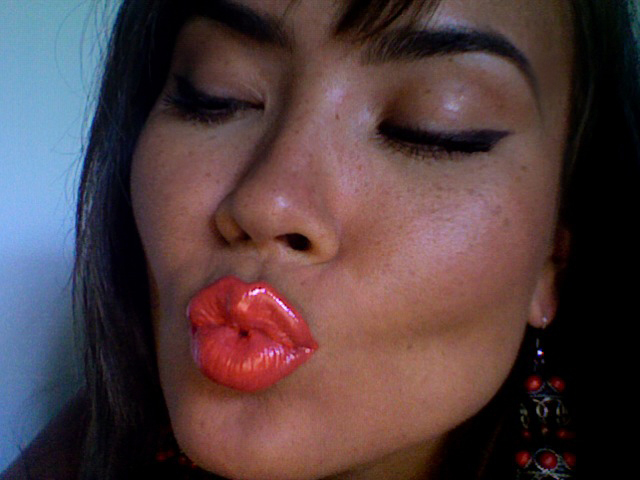 This color combo is so Santa Fe, and the tangerine lipstick looks delicious! Not really a color I could pull off but it looks beautiful on you. Definitely makes the tan pop. love this look! those two colors look lovely together! I love your nail polish!! Very pretty :) The lip color looks great too! love these colours togheter! and I really like your rings!! love the lips! and your eyebrows look so fab!!! you look lovely, and I really like what you did to your nails! 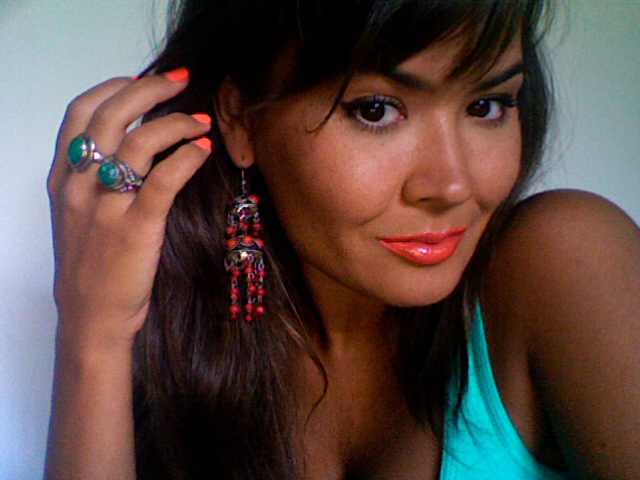 I absolutely love this<3 Lips, nails, and earrings, so gorgeous! Perfect for summer! i don't think there is a single color that doesn't look great on you ! @Laiqah: NO, Thank you Doll!!! WOW! That is one fantastic lip colour! It really pops against your lovely tanned complexion! You look so pretty ! I love your nails and your makeup ! !